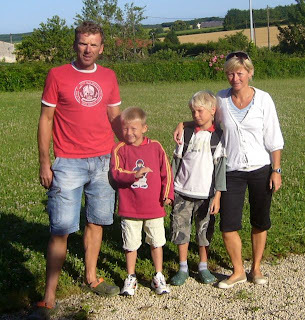 By chance we have some friends who live very near Guérande, Lorraine & Kevin and their kids Sebastian & Nichole. 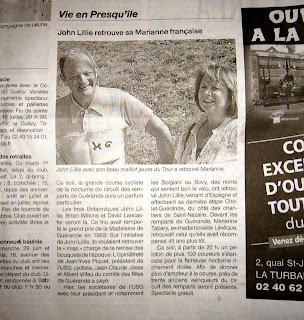 They moved to France a few years ago and are rebuilding a gîte out in the wilds. When I was the patron of a société in England Lorraine was my french speaking bras doit. We went round for cous-cous and a sing-song. 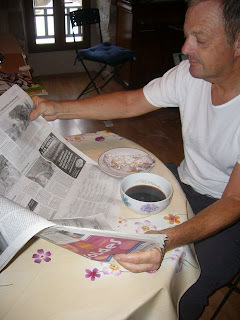 Here I am having a big breakfast and scanning the Ouest France newspaper to find a pic and story about my search to recreate the photo taken in 1963. It's a small world, they found the girl who gave the flowers all those years ago. In fact, she was still living nearby. We then posed for the press, as you see below. My ride from Spain to Guérande in France to attend a reunion with two old mates at a bike race we rode 45 years ago. 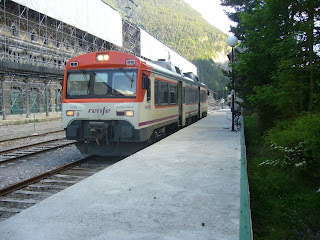 At Huesca caught a funny little one carriage train to Canfranc in the Pyrenees. First 8k up to the top of the mountain and suffered oxygen debt on the way so walked for 200m, must be the thin air, have to ask Brett Sutton if this qualifies as altitude training! 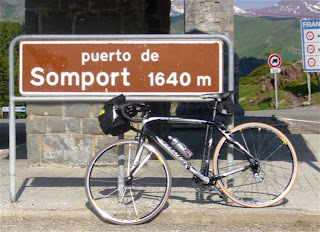 Then recovered enough to ride over the top at the Col du Somport and into France. Spent most of the rest of the day wizzing downhill,stopped for a coffee then arrived at a nice village hotel in Amou. 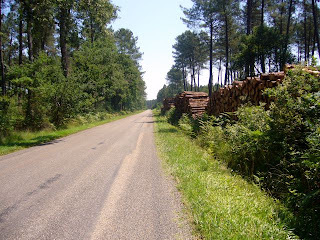 Rode along some very straight roads for longer than I wanted to as all the hotels seemed to be closed. Ended up at v poncy place, overpriced grub and dead mosquitos stuck to the bedroom wall (wouldn't go there again). Interesting day, rode round the west side of Bordeaux to catch a ferry at Lamarque en Medoc. As the next ferry was in 2 hours time had a glass of beer and big plate of mussels and chips in riverside restaurant. 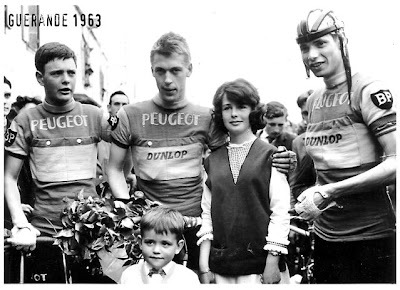 In 1961 I raced in Lamarque and won a couple of bottles of very nice wine, which was my introduction to claret (before that I used to drink menthol flavoured lemonade). I imagine it was good wine, the bottles were covered in dust and crap from the wine cellar but had no labels, so I never knew exactly what they were (except nice). 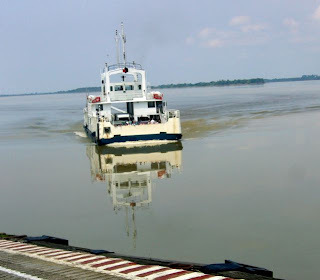 The ferry crossed the river Garonne and docked in Blaye. I continued riding very slowly as a result of scoffing the mussels and beer, and a headwind and a rough road and it was all uphill. Arrived at stage town, Mirabeau, only to find all the hotels fermé except for the Chateau de Mirabeau which had a room for €300 (this did include breakfast). 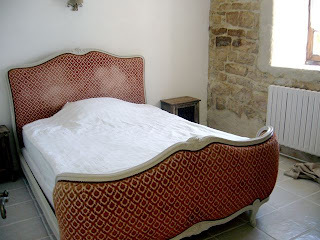 Urgent phone calls back to Spain and in a joint family operation they found me a hotel in Jonzac 20k down the road. Quite a tough day's riding. Headwind etc but pleased to arrive at St Mande sur Bredoire home of the Hobsons, Richard and Dorte and their boys Oliver and Oscar. 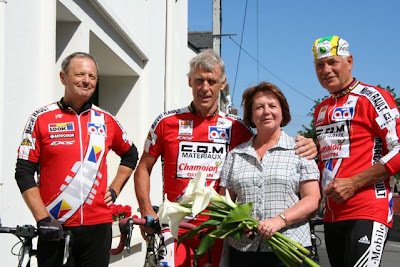 Richard was a triathlete back in the days - and they now run holiday gites in this part of the Charent Maritime. That evening I cooked my speciality Tarragon Chicken for everyone and stayed in the presidential suite. Next day was a Jour de Repose, so did nothing. Long day, over 7 hours riding, but arrived right on time for my appointment at the town hall. Denia and Cholet are twin towns and I had a letter to deliver from our Mayor for the Cholet Mayor. Met up with Sally, who arrived by car with the letter, we had a convivial meeting with "Premier Adjoint au Marie Geraldine Delorme", gave our compliments and retired to a little hotel an an excellent Thai dinner. 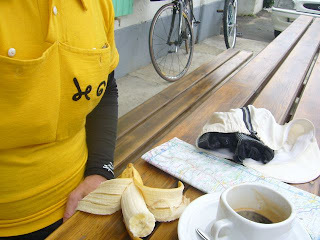 Thursday Cholet to Guerande 85km. I *intended* to ride all the way but took an easier option and cut off 60km by taking a lift to Nantes and riding from there. 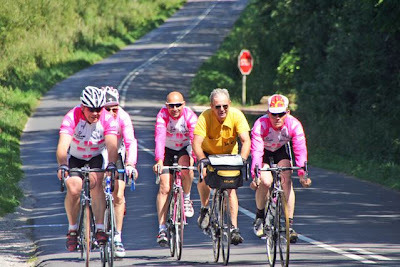 Passing through St Nazaire I was met by an entourage from the local club US Guérandaise Ciclisme and escorted the last 20k at the same time a photographer from Ouest France (Jean-Luc Merlet- thanks for the pic below) was snapping away for tomorrow's edition. rubble . . . . ?) 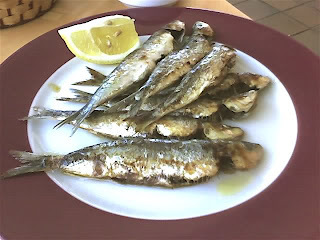 would be a bit outré for Wednesday lunch. 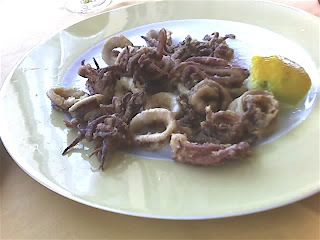 In fact the Escombros, (little bits of fried cuttle fish) were delicious!